Public Events Swing Dance classes with VERMONT SWINGS! 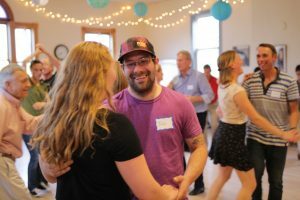 Swing Dance classes with VERMONT SWINGS! Vermont Swings comes to the Grange Hall Cultural Center! No partner necessary to enroll! Join us for an introduction Lindy Hop swing dance, a fun social dance that is most often associated with Jazz and Big Band Music from the 1920s to 1940s. This class will teach a variety of moves and techniques to get you moving on the dance floor. Designed to be progressive, so we will learn new moves building on the skills of the previous week, but drop-ins are welcome if space allows. The basics of the dance, rhythm, and movements you need to have you dancing with any partner by the first night and help you develop skills to use in any social dance environment from clubs to weddings and beyond! — No partner or previous dance experience required; these classes are suitable for dancers of all levels. — Please bring a change of clean, soft-soled, non-marking shoes to protect your knees and our wooden dance floor. –Please plan to arrive 15 minutes early to the first class to register and sign-in. The more you take, the more you save! Discounts do not apply to all workshops uniformly–please note the differences indicated in each description. All workshops must be paid in full, 7 days in advance of first class to receive discounts. Thanks for putting this together. We’re psyched about the opportunity! !